Abode Venue features over 9,500 square feet of space, available for your wedding, or anniversary, charity event, office gathering, birthday bash, Christmas party and more. Activate the Ark is a free, public event highlighting the Arkansas River is one of Wichita's most beautiful natural assets. The Century II Performing Arts & Convention Center is a multi-functional facility, fully accessible to all users. Goddard is a fast growing community and was recognized as the fastest growing city in Kansas by the U.S. Census in 2010. Apothecary and event venue. A space where people can come to dig to the soul and heart of healing and what it is they truly want out of this life. Soccer club proudly made in ICT. Founded in 2013 and comprised of Men's (NPSL) and Women's (WPSL) teams, and a youth academy. Supporting a diversity of youth, amateur and professional sporting programs and events. Wichita's premier roller derby league. Taste a wide array of beers from around the world at the 18th annual Midwest Beerfest. Now at Kansas Star Casino! The NBC tournament has been making baseball history for more than 80 years. We have one of the flattest and fastest courses with truly unrivaled beauty and community involvement, throughout the heart of Wichita's growing urban and residential areas. South Central Kansas' ticketing agency for concerts, sporting events and entertainment in the Wichita area. Where you and your friends can bounce, jump, dive, and slide across over 20 different obstacles. All you will need is a swimsuit, towel, and energy! Perfect for all ages!! Nestled in the heart of Delano our mission is to build and promote the dance community in Wichita. TFF showcases the best of independent cinema with independent films and filmmakers from around the globe. 191 films to choose from. Events facility that hosts concerts, roller derby, dances, comedians and stage shows featuring nationally known artists and performers. 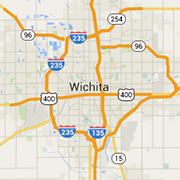 Wichita's premier Comedy Club and Entertainment venue. The Loony Bin hosts comedy acts most Wednesdays and every Thursday, Friday and Saturday. Premier Fireworks Retailer, serving Andover, Kansas for over 20 years. This action-packed 5K race includes multiple obstacles, water and mud, challenging both your endurance and your mind! Can you survive?